If you’re like me, you had to read Homer’s Illiad, a tale set during the Trojan War, in high school. And if you’re like me, you would have been less than impressed by that classic tale. I love battle books, I love books involving warriors and swordfighting and acts of heroism and honor, and so I should have loved Homer’s epic story. But the style and language of the Illiad overshadowed all the battling, heroism, and even the swordfighting. 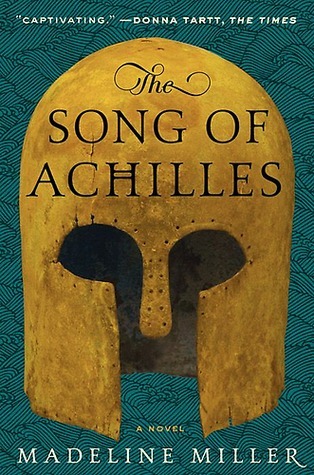 Thank goodness Madeline Miller, a high school classics teacher, wrote The Song of Achilles, for her retelling of the story includes everything I love in such books and none of things I don’t. The Song of Achilles is told from the point of view of Achilles’ friend, Petroculus. Petroculus meets Achilles at the palace of King Peleus, and the two become friends. King Peleus sends the two young men into the wilderness to be trained by Chiron, King of the cave-dwelling Centuars. The young men become warriors become embroiled in the Trojan War, and the rest is history. One thing I found astonishing about this book was the depth and complexity of her characters. They practically walk off the page. Achilles’ mother, a sea-nymph named Thetis, was such a wonderfully fierce wild being that when she was on the page, I was certain that the gods of ancient Greece were real. Also, Ms. Miller’s prose is so beautiful–every word has a purpose–it is like reading a poem. Her prose touched my soul, I think. While battles rage and kings and warriors maneuver for power, underneath is a sense of quiet calm and hidden depths. This is a powerful gem of a book. If you are looking for a classic book to enjoy, yet you want poetry and battles and acts of heroism, this is the book for you.